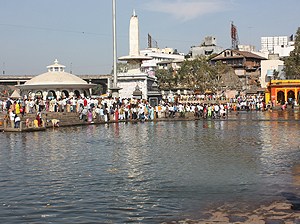 River Godavari flows through Nashik and its Northern part is called as Panchavati. It is said that lord Shri Ram and Sita along with Laxman stayed at Panchavati for some time. Thus Panchavati has gained holy importance. There are five Banyan (Vad) trees and hence the area is called Panchavati.Nearby is Sita Gumpha (cave) where Sita is said to have stayed for some time. Tapovan literally means precincts reserved for meditation and penance. There is such a precinct for penance ahead of Panchavati and hence was named Tapovan. The sages used to meditate in close proximity with the lush green nature. Laxmana – brother of Rama – used to stay here and had cut nose of Shurpanakha – sister of Ravana. 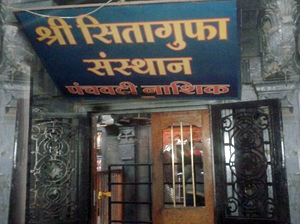 This place has temples of Laxmana and Hanuman. Even today, this locale captivates mind because of Godavari’s silently gurgling stream, long stretch of green woods and closeness to jungle’s flora and fauna. A cavernous fissure on boulders along the riverbed is called Brahma Yoni. Very close by, is the Kapil Tirth. On the right bank of Godavari, there are eleven rocky cavernous spaces where rishi-munis must have been retreating for sacraments. There are temples of Gopalkrishna and Lakshmi-Narayan and the famous Goshala (cow-shed) was built here in 1904. In ancient time, this land was made sacred by the touch of Lord Rama’s feet. The Gumpha (i.e. Cave) is near the five Banyan trees in Panchavati. One can enter the cave with the help of a very narrow staircase. The cave has the idol of Shree Ram, Laxman and Sita. To the left, one can enter into the cave having the Shiva Linga. 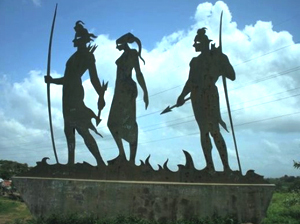 Devotees believe that Ravan kidnapped Sita from the same place. The most important place in Panchavati is Ramkund. It is so called because Lord Rama is believed to have taken bath there. Mortal remains (Asthi) immersed in this kunda, are immediately absorbed in the water. A dip in this sacred kunda is considered very pious. Situated nearby is Gandhi Lake (Talav) having a memorable monument made out of white marble, in memory of the Father of the Nation. The ashes were dropped in Ramkund after Gandhiji passed away on 30th January 1948. Mr. Nehru was also present on this occasion. Another important temple is that of Kala Ram. This temple was built by Peshwas. There are great processions and utsav on Ramnavami, Dasara and Chaitra Padwa (Hindu new year day). The specialty of the temple is that it was built with black stones.The stones were brought from Ramshej 200 years ago. It took 23 lakhs of rupees and 2000 workers to build the temple in 12 years. The apex of the temple is made up of 32 tons of gold. In 1930, Dr. Ambedkar performed Satyagraha, to allow the entry of Harijans into the temple. Situated in Panchavati area, on the bank of river Godavari – fondly called as anga by Nasikites – isNaroshankar Temple of Rameshwar built by Naroshankar Rajebahaddur in 1747. The architectural style of the temple is called “Maya” style. It is one of the most beautiful pieces of temple architecture of the 18th century. The main temple is on a platform. Rather than inside of the temple, sculpture on the outer part is stunning. It has rows of striking designs. One layer is of decorative lacework. The next one is that of peacocks holding bead garlends. In four directions are statues of the saints in Padmasana – one holding rosary, the other one a holy book – they are all scholars. Some of the statues are deformed – their hands are broken. There is also an assembly of animals – tigers, monkeys,elephants etc. This depicts that Hindu culture is not limited only to human beings but also has relation with birds, animals, trees, and nature in general. The temple is surrounded by 11 feet fortification. In its four corners are umbrellas – called “Meghadambari” or “Barasati”. One of them was washed away by Godavari floods and only three are existing presently. The fortification also centres a “Bell house” in the front part. The famous bell , called “Naroshankar Bell” is fixed there. The bell is a victory memorial over Portuguese. The Maratha Ruler Bajirao Peshwa’s younger brother Chimaji Appa won the fort of Vasai against Portuguese. The famous knight of Peshwas – Mr Naroshankar Rajebahaddur played a critical role in this war. After winning the fort, Vasai Portuguese Church bell was removed, marched on elephant till Nashik with great celebration and offered to Naroshankar as a medal – an award for his bravery. It is made of bronze, with six feet diameter. The year engraved on it is 1921. The bell jingle can be heard up to 5 miles, it is said. This bell and its ringing is so famous that a phrase is coined after it in Marathi. If a woman is talking in a very high pitch, she is called “Naroshankarachi ghanta”. 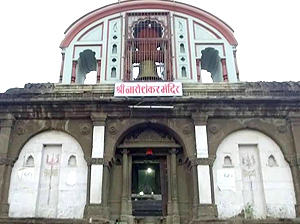 Recently renovation of the bell is undertaken by the Municipal Corporation of Nashik. 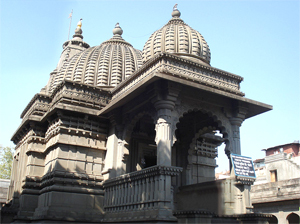 Sundarnarayan temple is situated at the corner of Ahillyabai Holkar Bridge. The story goes like this : Vrinda Devi was a very pious and faithful wife of Jalandar – a wicked demon. Jalandar, a mighty crook, was the devotee of Lord Shiva. Pleased with his prayers and impressed by Jalandar’s wife’s chastity, Lord Shiva gave him a boon that made him immortal. With this boon, Jalandar became vicious and started creating havoc on earth. He not only troubled human beings, but also disturbed the Gods. He even ventured to pick up a quarrel with Lord Shiva himself. It became necessary to eliminate him which was contrary to the boon given by Lord Shiva. The only way out was to suspect Vrinda Devi’s chastity. For this task Lord Vishnu duplicated himself to look like Jalandar and lived with Vrinda Devi. Thus her chastity was suspected and the boon given to Jalandar was withdrawn and he was destroyed. When Vrinda Devi came to know of the trick played by Lord Vishnu, she got furious and cursed Lord Vishnu. His attractive body turned black due to the curse. Lord Vishnu took a holy bath in the river Godavari and regained his complexion. Since he became beautiful again, – the Lord is named as Sundarnarayana. Sundar in Marathi means beautiful. 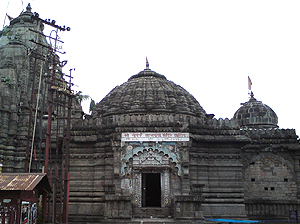 The Sundarnarayan temple is built by Gangadhar Yashwant Chandrachud in 1756. The entrance of the temple is to the East. The two Mandaps may be small but their architecture is attractive and the round dome is made by little ornamental cordons. The arched recesses are impressions by Mughal style because during the Mughal Regime many temples were demolished by Muslims and graveyards were built in their place. The main deity is of Lord Vishnu – alias Narayana . To his left and right are Laxmi and Saraswati respectively. Fine design is carved on the stones of the temple. On the road leading towards Godavari River there is pond named Badarika Sangam Pond. It is said that the king of Devgiri bathed and performed rites in this pond. We also find a mention of this pond in the holy book Dnyaneshwari. One remarkable thing about this temple is that it is built at such an angle that on 21st March, rays of the rising Sun first fall exactly upon the idols. Copyright © 2005-2017, All Rights Reserved.